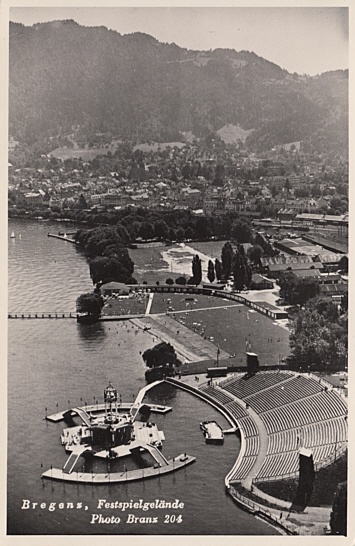 1947 installation of a flexible lake stage off the "Strandbad" beach and a flexible auditorium with 2500 seats. 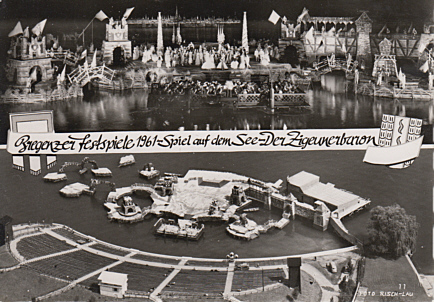 1950 installation of a permanent lake stage on an artificial island, with a flexible auditorium of 6500 seats. Opened 22 July 1950 with Millöcker's "Gasparone". 1953 installation of a permanent auditorium with 6400 seats. 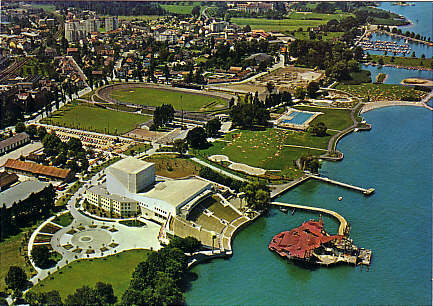 1979 major rebuilding: installation of a lake stage with concrete foundations including an orchestra pit in the basement. Auditorium rebuilding (originally 4400 seats, later gradually expanded by flexible seating to 6800 seats). Re-opened 20 July 1979 with Puccini's "Turandot". 1984 installation of a new sound system, using focused directional amplification. 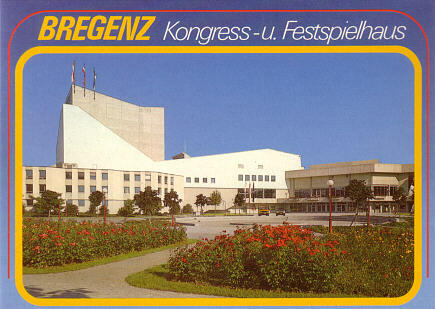 1998 expansion of the permanent auditorium (6767 permanent seats). 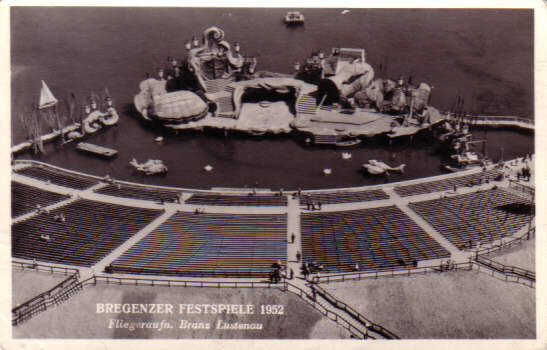 Used for opera performances by the annual "Bregenzer Festspiele" summer festival. Festspielhaus: Built 1980 by Willy Braun jr. 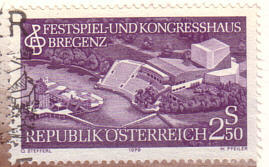 Opened 18 July 1980 with a symphonic concert. First opera performance on 24 July 1980 with Verdi's "Falstaff". 1992-1997 extensions by Helmut Dietrich and Much Untertrifaller. Up to 1765 seats. 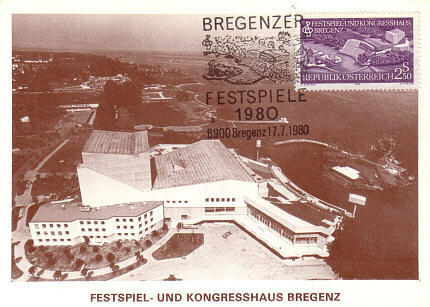 Used for opera performances and concerts by the annual "Bregenzer Festspiele" summer festival. 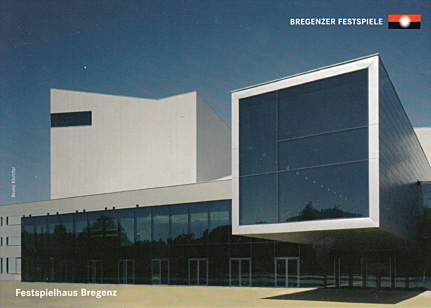 Also used for ballet performances by the annual dance festival "Bregenzer Frühling" in spring, and for concerts and conventions throughout the year. 2005-2006 exterior and interior renovations and rebuilding by Dietrich/Untertrifaller Architekten. Re-opened 7 July 2006. Werkstattbühne: Rehearsal stage and flexible performance space, built 1992-1997 by Helmut Dietrich and Much Untertrifaller. 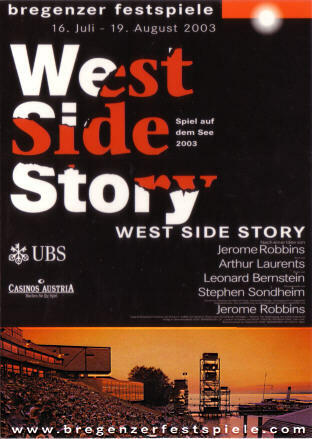 Opened 1998 with G. F. Haas's opera "Nacht". Capacity: up to 2000 persons. Used for opera, ballet, and drama performances, and for concerts during the annual "Bregenzer Festspiele" summer festival. Also used for popular concerts and various events throughout the year. 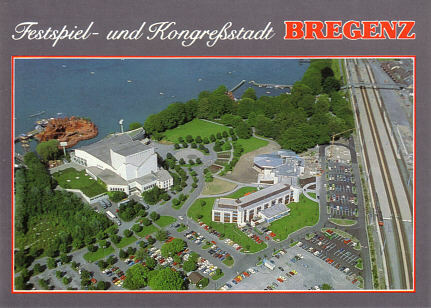 Front Text: "Bregenz. 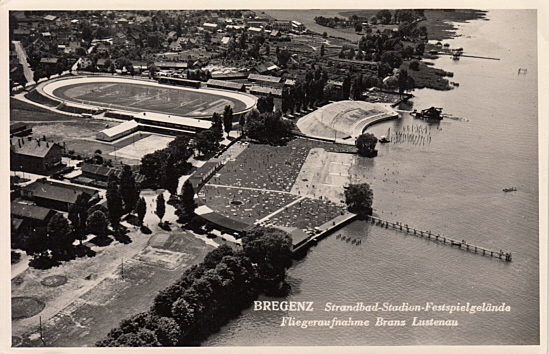 Strandbad - Stadion - Festspielgelände"
Reverse Text: "Bregenzer Festspiele 1952"
Front Text: "Bregenzer Festspiele 1961 - Spiel auf dem See - Der Zigeunerbaron"
Front Text: "Festspiel- und Kongresshaus Bregenz"
Stamp: "Festspiel- und Kongresshaus Bregenz"
Postmark: "Bregenzer Festspiele 1980 - 6900 Bregenz 17.7.1980"
Reverse Text: "Bregenz am Bodensee - Kongreßhaus, Festspiel-Bühne und Tribüne, Schwimmbad, Stadion, Segelhafen"
Front Text: "Bregenz Kongress- u. Festspielhaus"
Reverse Text: "Festspiel- und Kongreßhaus, eröffnet 17.7.1980, Bregenz am Bodensee, Vorarlberg - Austria"
Front Text: "Festspiel- und Kongreßstadt Bregenz"
Reverse Text: "Hotel Mercure u. Spielcasino, Festspielhaus und Seebühne, Bregenz am Bodensee, Vorarlberg - Austria"
Picture: Seebühne in 1999 or 2000 during a performance of Verdi's "Un ballo in maschera"
Reverse Text: "Bregenzer Festspiele - 16. Juli bis 19. 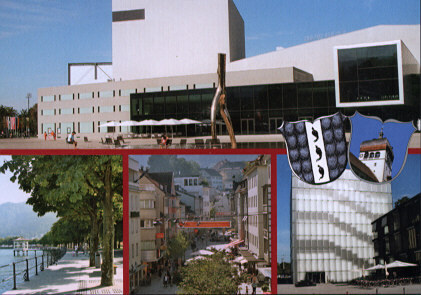 August 2003 - West Side Story"
Reverse Text: "Bregenz: Festspielhaus, Seeanlagen, Kunsthaus, Fußgängerzone Kaiserstraße"
Reverse Text: "Bregenzer Festspiele", "Festspielhaus Bregenz"